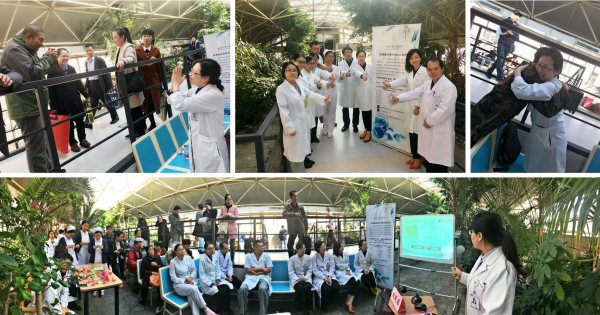 A series of activities was hosted by Beijing Cancer Hospital Palliative Care Centre & Day Care Centre under theme of " PALLIATIVE CARE ENCOUNTERS DAY CARE---SPEAK FOR YOURSELF" to celebrate World Hospice and Palliative Care Day in 13 October, 2017. The celebration started with a few lectures. Palliative care medical team was invited to preach the concept of palliative care and the importance and necessity of early palliative care in the whole process of disease management to the patients and family members. The plan of establishing a "no vomiting, painless, no thrombosis" day care ward was introduced to further promote the individualized treatment for cancer patients with minimum incidence of side effects. After the lecture, doctors and patients were organized to make handmade paper crane together. In Chinese culture, paper crane represents the best wishes. Interaction between doctors and patients creates a good communication platform which is beneficial for patients to express themselves. The day also included an activity of patients and family members talking about their own feeling and perspective of how palliative care help them through hard time. The notion of "Please speak for yourself" lit up the highlights of the activities, and encouraged patients to express their inner voice and thoughts bravely! The attendees are very engaged and there were some emotional moments. The atmosphere of the celebration is warm and touching. It helps patients express their true thoughts and needs, as well as improving their consciousness to palliative care. The palliative service provided by Beijing Cancer Hospital Palliative Care Centre & Day Care Centre is moving towards standardization and precision, aiming at achieving international advanced level.